Blessed is our God always; now and ever, and unto the ages of ages. Amen. Holy God, Holy Mighty, Holy Immortal : have mercy on us. Holy God, Holy Mighty, Holy Immortal : have mercy on us. For thine is the kingdom, and the power, and the glory; of the Father, and of the Son, and of the Holy Spirit. Now and ever, and unto ages of ages. With the spirits of the righteous made perfect, give rest to the soul of thy servant, O Saviour; and preserve it in that life of blessedness which is with thee, O thou who lovest mankind. Thou art our God, who descended into hell, and loosed the bonds of those who were there; Thyself give rest also to the soul of thy servant. O Virgin, alone pure and immaculate, who without stain didst bring forth God, intercede for the salvation of his soul. Have mercy on us, O God, according to thy great goodness, we pray the: hearken and have mercy. Again we pray for the repose of the soul of the servant of God, of blessed memory and everlasting repose, the Priest N., departed this life; and that thou will pardon his every transgression, both voluntary and involuntary. The mercies of God, the kingdom of heaven, and remission of his sins, let us ask of Christ our Immortal King and our God. O God of spirits and of all flesh, who has trampled down death, and made powerless the Devil, and given life to thy world: Do thou the same Lord, give rest to the soul of thy departed servant, of blessed memory and everlasting repose, the Priest (name), in a place of brightness, a place of verdure, a place of repose, whence all sickness, sorrow, and sighing have fled away. Pardon every sin which he hath committed, whether by word, or deed, or thought; for Thou art good and loveth mankind: for there is no man who liveth and sinneth not, and Thou only art without sin, and Thy righteousness is to all eternity, and Thy law is truth. For thou art the Resurrection, and the life, and the Repose of thy departed servant, of blessed memory and everlasting repose, the Priest N., O Christ our God, and unto thee we ascribe glory, together with thy Father who is from everlasting, and thine all-holy, good, and life-giving Spirit: now and ever, and unto ages of ages. Wisdom! O Blessed Theotokos, who art most holy, save us. More honorable than the Cherubim and beyond compare more glorious than the Seraphim, thou who without stain barest God the Word, and art truly Theotokos, we magnify thee. Glory to thee, O Christ our God and our hope: glory to thee. Lord, have mercy. Lord, have mercy. Lord, have mercy. In the name of the Lord, Master bless. May he who rose again from the dead, Christ our true God: through the intercessions of his all immaculate and all blameless holy Mother; of our venerable and God-bearing Fathers; and of all the Saints; establish the soul of his servant, of blessed memory and everlasting repose, the Priest N., departed this life, in his holy mansions; and number him among the just, and have mercy upon us, forasmuch as He is good and loveth mankind. May his memory be eternal. May his memory be eternal. May his memory be eternal. Through the prayers of our Holy Master, O Lord Jesus Christ, have mercy upon us and save us. Bishop: Blessed is our God always, now and ever, and unto ages of ages. Blessed are those whose way is blameless, who walk in the law of the Lord. Alleluia. Blessed are those who keep his testimonies, who seek him with their whole heart. Alleluia. Thy hands have made me and fashioned me; give me understanding that I may learn thy commandments. Have mercy upon thy servant. Those who fear thee shall see me and rejoice, because I have hoped in thy word. Have mercy upon thy servant. I know, O Lord, that thy judgments are right, and that in faithfulness thou hast afflicted me. Have mercy upon thy servant. Look upon me, and be merciful to me, as is Thy name. Alleluia. Order my steps according to thy promise, and let no iniquity have dominion over me. Alleluia. Make Thy face to shine upon Thy servant, and teach me Thy statutes. Alleluia. - Blessed art thou, 0 Lord, teach me thy statutes. The Choir of the Saints have found the Fountain of Life and the Door of Paradise. May I also find the right way, through repentance. I am a lost sheep. Call me, O Saviour, and save me. - Blessed art thou, O Lord, teach me thy statues. O thou who of old didst create me from nothingness, and didst honor me with thine image divine, but because I transgressed thy commandments hast returned me again unto the earth from which I was taken : Bring me back to that likeness, to be reshaped in that pristine beauty. - Blessed art thou, O Lord, teach me thy statutes. T am an image of thy glory ineffable, though I bear the brands of transgressions: Show thy compassions upon thy creature, O Master, and purify me with thy loving-kindness; and grant unto me the home-country of my heart's desire, making me again a citizen of Paradise. Ye holy Martyrs, who preached the lamb of God, and like unto lambs were slain, and are translated into life eternal, which groweth not old; pray ye unto Him that he will grant us remission of our sins. establish him in Paradise; Where the Choirs of the Saints, and of the Just, shine like the stars of heaven; Give rest to thy servant who hath fallen asleep, regarding not all the charges against him. Ye who have trod the narrow way most sad; all ye who, in life have taken upon you the Cross as a yoke, and have followed Me through faith, draw near: Enjoy ye the honors and the crowns which I have prepared for you. Devoutly do we hymn the triple splendourof the one Godhead, crying aloud: Holy art thou, O Father, who art from everlasting; O Son, Co-eternal; and Spirit divine! Illumine us who with faith do worship thee; and rescue us from fire eternal. - Now and ever, and unto ages of ages. Amen. Hail, O Holy One, who for the salvation of all men didst bring forth God in the flesh, through whom the race of men hath found salvation; through Thee have we found Paradise, O Theotokos, O pure and blessed one. Alleluia, Alleluia, Alleluia, Glory to thee, O God. (Thrice). Again and again, in peace let us pray to the Lord. Lord, have mercy, Lord, have mercy, Lord, have mercy. Again we pray for the repose of the soul of the servant of God, of blessed memory andeverlasting repose, the Priest N., departed this life; and that thou wilt pardon his every transgression, both voluntary and in voluntary. That the Lord God will establish his soul where the just repose. The mercies of God, the kingdom of heaven, and remission of his sins, let ask of Christ, our immortal king and our God. For thou art the Resurrection, and the life, and the Repose of thy departed servant, of blessed memory and everlasting repose, the Priest N., O Christ our God, and unto thee we ascribe glory, together with thy Father who is from everlasting, and thine all-holy, good, and lifegiving Spirit: now and ever, and unto ages of ages. Give rest with the Just, O Saviour, unto thy servant, and make him to dwell in thy courts, as it is written. Overlooking, as thou art good, his sins both voluntary and involuntary, and all things done with knowledge or in ignorance, O Thou who lovest mankind. And all things, done with knowledge or in ignorance, O thou who lovest mankind. O Christ our God, who from the Virgin didst dawnforth upon the world, through Her making us children of the light, have mercy upon us. Blessed is the way in which thou shalt walk today; for a place of rest is prepared for thee. Unto thee will I cry, O Lord my Cod. The lesson from the Epistle of the Holy Apostle Paul to the Thessalonians. Brethren: T would not have you to be ignorant concerning them which are asleep, that ye sorrow not, even as others which have no hope. For if we believe that Jesus died and rose again, even so them also which sleep in Jesus will God bring with him. For this we say unto you by the word of the Lord, that we who are alive and remain unto the coming of the Lord shall not prevent them who are asleep. For the Lord himself shall descend from heaven with a shout, with the voiceof the archangel, and with the trump of God: and the dead in Christ shall rise first: then we who are alive and remain shall be caught up together with them in the clouds to meet the Lord in the air: and so shall we ever be with the Lord. Peace be to thee that readest. Blessed is he whom thou hast chosen and taken, O Lord. Wisdom! Attend! Let us hear the Holy Gospel, Bishop: Peace be to all. Choir: And with thy spirit. The Lord said to the Jews which came to him: Verily, verily, I say unto you, He that heareth my word, and believeth on him that sent me, hath everlasting life, and shall not come into condemnation; but is passed from death to life. Verily, verily, I say unto you, The hour is coming, and now is, when the dead shall hear the voice of the Son of God: and they that hear shall live. For as the Father hath life in himself, so hath he given to the Son to have life in himself; And hath given him authority to execute judgment also, because he is the Son of man. Marvel not at this: for the hour is coming, in which all that are in the graves shall hear his voice, and shall come forth; they that have done good, unto the resurrection of life; and they that have done evil, unto the resurrection of damnation. I can of mine own self do nothing; as I hear, I judge: and my judgment is just; because I seek not mine own will, but the will of the Father who hath sent me. 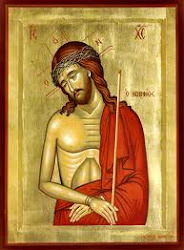 O Master, Lord our God, who alone hast immortality and dwellest in light unapproachable, who slayest and makest alive, who castest down into hell and again raisest up; Thou who in wisdom hast created man and returnest him to the earth again, exacting the spiritual debt: We beseech Thee, receive the soul of Thy servant, and grant him rest in the bosom of Abraham and Isaac and Jacob, and give him the crown of Thy righteousness, the portion of the saved, in the glory of Thine elect. And for those things which in this world he accomplished for Thy Name' s sake, may he receive a rich reward in the mansions of the saints: Through the grace and bounties and love toward mankind of Thine Only-begotten Son, our Lord Jesus Christ, with whom thou art blessed, together with thine all-holy, and good, and life-giving Spirit, now and ever, and unto ages of ages. You anoint my head with oil; My cup runs over. Surely goodness and mercy shall follow me all the days of my life; And I will dwell in the house of the Lord forever. Brethren: Therefore as sin came into the world through one man and death through sin, and so death spread to all men because all men sinned — sin indeed was in the world before the law was given, but sin is not counted where there is no law. Yet death reigned from Adam to Moses, even over those whose sins were not like the transgression of Adam, who was a type of the one who was to come. But the free gift is not like the trespass. For if many died through one man's trespass, much more have the grace of God and the free gift in the grace of that one man Jesus Christ abounded for many. And the free gift is not like the effect of that one man's sin. For the judgment following one trespass brought condemnation, but the free gift following many trespasses brings justification. If, because of one man's trespass, death reigned through that one man, much more will those who receive the abundance of grace and the free gift of righteousness reign in life through the condemnation for all men, so one man's act of righteousness leads to acquittal and life for all men. For as by one man's disobedience many were made sinners, so by one man's obedience man will be made righteous. Law came in, to increase the trespass; but where sin increased, grace abounded all the more, so that, as sin reigned in death, grace also might reign through righteousness to eternal life through Jesus Christ our Lord. Alleluia, Alleluia, Alleluia Blessed is he whom Thou hast chosen and taken, O Lord. Wisdom! Attend let us hear the Holy Gospel, Bishop: Peace be to all. Glory to Thee, O Lord, glory to Thee. Deacon: Let us attend! The Lord said to the Jews who came to Him, "My Father is working still, and I am working." This was why the Jews sought all the more to kill him, because he not only broke the Sabbath but also called God his Father, making himself equal with God. Jesus said to them, "Truly, truly, I say to you, the Son can do nothing of his own accord, but only what he sees the Father doing; for whatever he does, that the Son does likewise. For the Father loves the Son, and shows him all that he himself is doing; and greater works than these will he show him, that you may marvel. For as the Father raises the dead and gives them life, so also the Son gives life to whom he will. The Father judges no one, but has given all judgment to the Son, that all may honor the Son, even as they honor the Father. He who does not honor the Son does not honor the Father who sent him Truly, Truly, I say to you, he who hears my word and believes him who sent me, has eternal life; he does not come into judgment, but has passed from death to life." Let us pray to the Lord. Choir: Lord, have mercy. We give thanks unto Thee, O Lord our God, for Thou alone hast life immortal. Thy glory is ineffable, Thy love toward mankind is unutterable, Thy kingdom never fails, and with Thee there is no respect of persons; for unto all men Thou hast appointed a common debt of life, whose measure must be fulfilled, Therefore we entreat Thee, O Lord our God: Give rest in the bosom of Abraham and Isaac and Jacob unto Thy servant, of blessed memory and everlasting repose, the Priest (N.) who was a priest and our fellow-minister, who has fallen asleep in the hope of resurrection unto life eternal. And as Thou didst appoint him to be a minister of Thy Church on earth, so also make him the same at Thy heavenly altar, O Lord. As Thou hast adorned him with spiritual honor among men, so also receive him uncondemned into the glory of the angels. Thou Thyself has glorified his life upon the earth; in the same way, make glorious his departure from this life and his entrance among Thy saints, and number his soul with all those who from all the ages have been well-pleasing in Thy sight. For Thou art the resurrection and the life and the repose of Thy servant, of blessed memory and everlasting repose, the Priest N, who has fallen asleep, O Christ our God, and unto Thee do we ascribe glory, to the Father and to the Son and to the Holy Spirit, now and ever and unto ages of ages. In faith and hope and love in meekness and purity and priestly worth, uprightly you discharged your sacred functions, O memorable one. Therefore the eternal God whom you served shall Himself establish your spirit in a place of brightness and beauty, where the righteous rest, and you will receive pardon and great mercy at the judgment day of Christ. His soul shall dwell with the blessed. Unto Thee, O Lord, will I cry: Despise me not, O Lord, my strength. The reading is from the 1st Epistle of the Holy Apostle Paul to the Corinthians. Christ has been raised from the dead, the first fruit of those who have fallen asleep. For as by a man came death, by a man has come also the resurrection of the dead. For as in Adam all die, so also in Christ shall all be made alive. But each in his own order: Christ the first fruits, then at his coming those who belong to Christ. Then comes the end, when he delivers the kingdom to God the Father after destroying every rule and every authority and power. For he must reign until he has put all his enemies under his feet. The last enemy to be destroyed is death. "For God has put all things in subjection under him," it is plain that he is excepted who put all thing under him. When all things are subjected to him then the Son himself will also be subjected to him who put all things under him, that God may be everything to every one. Blessed is the man that fears the Lord. His seed shall be mighty in the earth. Wisdom Attend! Let us hear the Holy Gospel. Bishop: Peace be unto all. Choir: And to thy spirit. Glory to thee O Lord, Glory to thee. Deacon: Let us attend! The Lord said to the Jews who came to Him: "This is the will of my Father, that every one who sees the Son and believes in him should have eternal life; and I will raise him up at the last day." The Jews then murmured at him, because he said, "I am the bread which came down from heaven." They said, was not this Jesus, the son of Joseph, whose father and mother we know?" How does he now say, "I have come down from heaven?" Jesus answered them, "Do not murmur among yourselves. No one can come to me unless the Father who sent me draws him: and I will raise him up at the last day." Choir: Glory to thee O Lord, Glory to thee. Blessed are they that do hunger and thirst for righteousnes sake, for they shall be filled. When Adam of old ate of the tree which was for food, he was driven out of Paradise. But when the thief, as he hung upon the cross, confessed Thee to be God, he was made a citizen of Paradise. And we, who have been saved by Thy Passion, O Master, imitating the thief, with faith cry out: Remember us also, when Thou comest into Thy Kingdom. Taking clay from the earth, He who created me fashioned my body through his divine will; and after breathing into it a soul with His life-bearing breath, he laid upon it a holy command. Therefore hast Thou called me who am subject to the corruption of sin, O Thou who lovest mankind, because of Thy boundless compassion. But grant rest with Thy saints, O God, unto him whom Thou hast called. When the soul is parted from the body, fearful is the mystery and terrible to all men: for the soul goes forth lamenting, and the body is committed to the earth, and hidden from sight. Therefore, I since we too have learned our final end, let usl entreat the Savior, crying aloud with tears: Remember us also, O Lord, when Thou comest into Thy Kingdom. Blessed are they who are persecuted fo: righteousness sake, for theirs is the Kingdom o; Heaven. "Why do you mourn me so violently, O men? Why do you clamor so vainly?" he who is called hence proclaims to all. Death is a rest unto all men. Therefore let us listen to the voice of Job, when he says: "Death is rest unto man." But grant rest with Thy saints, O God, unto him whom Thou host taken. Blessed are ye when men shall revile thee and persecute thee, and shall say all manner of evil against thee falsely for my sake. Paul, the all-wise, clearly foretold translation hence, teaching all men that the dead shall rise again incorruptible, and we shall all be changed by divine command. Then shall the trumpet ring out with dreadful alarm, and they who in all the ages have gone unto their rest shall arise from their sleep. But grant rest with Thy saints, O God, unto him whom Thou hast taken. Without seed, O Lady, you supernaturally conceived in your womb the God who was before all the ages, and bore him in the flesh, both God and man, without change of essence, and with essence still unmingled. Therefore we always acknowledge you as Theotokos, and unto the God who was born of you we cry with faith: Remember us also in Thy Kingdom. Blessed is he who Thou hast chosen and taken, O Lord. His soul shall dwell with the blessed. Brethren: He who observes the day, observes it in honor of the Lord. He also who eats, eats in honor of the Lord, since he gives thanks to God; while he who abstains, abstains in honor of the Lord and gives thanks to God. None of us lives to himself, and none of us dies to himself. If we live we live! to the Lord, and if we die, we die to the Lord; so then whether we live or whether we die, we are the Lord's. For to this end Christ died and live; again, that he might be Lord both of the dead and of the living. Wisdom Attend! Let us hear the Holy Gospel. Bishop: Peace be to all. The reading is from the Holy Gospel according to St John. Glory to thee O Lord, Glory to thee. The Lord said to the Jews who came to Him: "I am the bread of life. Your fathers ate the manna in the wilderness, and they died. This is the bread which comes down from heaven, that a man may eat of it and not die. I am the living bread which came down from heaven; if any one eats of this bread, he will live forever; and the bread which I shall give for the life of the world is my flesh." The Jews then disputed among themselves saying, "How can this man give us his flesh to eat?" So Jesus said to them, "Truly, truly, I say to you, unless you eat the flesh of the Son of man and drink his blood, you have no life in you; he who eats my flesh and drinks my blood has eternal life, and I will raise him up at the last day. Have mercy upon me, O God according to thy great mercy; and according to the multitude of thy tender mercies blot out mine iniquity. Wash me thoroughly from mine iniquity, and cleanse me from my sin. For I acknowledge mine iniquity: and my sin is ever before me. Against thee only have I sinned, and done evil in thy sight: that thou mightest be justified in thy words, and prevail when thou art judged. For, behold, I was shapen in iniquity, and in sins did my mother conceive me. For, behold, thou hast loved truth: the unclear and hidden things of thy wisdom thou hast made clear to me. Thou shalt sprinkle me with hyssop, and I shall be clean: thou shalt wash me, and I shall be whiter than snow. Thou shalt make me to hear joy and gladness: the bones which thou bast broken shall rejoice. Turn away thy face from my sins, and blot out all my iniquities. Create in me a clean heart O God; and renew a right spirit within me. Cast me not away from thy presence; and take not thy holy spirit from me. Restore unto me the joy of thy salvation: and steady me with a guiding Spirit. Then will I teach transgressors thy ways; and the impious shall be converted unto thee. Deliver me from blood-guiltiness, O God, thou God of my salvation: and my tongue shall sing aloud of thy righteousness. O Lord, open thou my lips; and my mouth shall declare thy praise. For hadst thou desiredst sacrifice, I would have given it thee: thou delightest not in burnt offerings. Sacrifices to God are a contrite spirit: a contrite and humble heart, O Ged, thou wilt not despise. Do good, O Lord, in thy good will unto Zion: that the walls of Jerusalem may be built up. Then shalt thou be pleased with a sacrifice of righteousness, with burnt offering, and whole burnt-offerings: then shall they offer calves upon thine altar. Now I am at rest. Now I have found peace. I have escaped corruption. I have passed from death to life. Glory to Thee, O Lord. Praise ye the Lord from the heavens! Praise ye Him in the Highest! for to Thee praise is due, O our God. Praise ye Him all His angels! Praise ye Him, all His host! for to Thee praise is due, O our God. Praise God in His sanctuary! Praise ye Him in the firmament of His power! for to Thee praise is due, O our God. Praise Him for His mighty acts! Praise Him according to His excellent greatness! for to Thee praise is due, O our God. Praise Him with the sound of trumpet! Praise Him with psaltery and Harp! for to Thee praise is due, O our God. Praise Him with timbrel and dance! Praise Him with strings and organs! for to Thee praise is due, O our God. Praise Him with high sounding cymbals! Praise Him on cymbals of joy! for to Thee praise is due, O our God. Thy godly minister, made a partaker of the divine nature at his departure, through Thy life-giving mystery now has come unto Thee, O Christ. Receive his soul like a bird in Thy hand, O Thee, O Christ. Receive his soul like a bird in Thy hand, O Savior. Establish him in Thy courts and in the angelic choir. And on account of Thy great mercy, O Lord, give rest unto him whom Thou hast taken by Thy command. Glory to the Father and to the Son and to the Holy Spirit: Now and ever and unto ages of ages. Amen. We have come to the knowledge of God who was incarnate of you O Virgin Theotokos. Entreat Him that He will save our souls. Glory to God In the highest, and on earth peace, good will toward men. We praise Thee, we bless Thee, we worship Thee, we glorify Thee, we give thanks to Thee for Thy great glory: O Lord, heavenly King, God the Father Almighty; O Lord, the only-begotten Son, Jesus Christ; and the Holy Spirit. O Lord God, Lamb of God, Son of the Father, that takest away the sins of the world, have mercy on us. Thou that takest away the sins of the world, accept our prayer. Thou that sittest on the right hand of the Father, have mercy on us. For Thou alone art holy, Thou alone art Lord, Jesus Christ, in the glory of God the Father. Amen. Every day I will bless Thee and praise Thy name forever, and ever. Lord, Thou hast been our refuge from generation to generation. I said: Lord, be merciful unto me. Heal my soul, for I have sinned against Thee. Lord, I flee unto Thee. Teach me to do Thy will, for Thou art my God. For with Thee is the fountain of life, and in Thy light shall we see light. Continue Thy mercy unto those who know Thee. Vouchsafe, O Lord, to keep us this day without sin. Blessed art Thou, O Lord, the God of our Fathers, and praised and glorified is Thy name forever. Amen. Let Thy mercy be upon us, O Lord, even as we have set our hope on Thee. Blessed art Thou, O Lord, teach me Thy statutes. Blessed art Thou, O Master, make me to understand Thy commandments. Blessed art Thou, O Holy One, enlighten me with Thy precepts. Thy mercy, O Lord, endureth forever: O despise not the works of Thy hands. To Thee belongeth worship, to Thee belongeth praise, to Thee belongeth glory, to the Father and to the Son and to the Holy Spirit, now and ever, and unto ages of ages. Amen. Have mercy upon us, O God, according to Thy great goodness we pray Thee hearken and have mercy. Again we pray for the repose of the soul of the servant of God, of blessed memory and everlasting repose, the Priest (N.) departed this life; and that Thou wilt pardon his every transgression, both voluntary and involuntary. The mercies of God, the Kingdom of heaven, and remission of his sins, let us ask of Christ, our immortal King and our God. O God of spirits, and of all flesh, who hast trampled down death, and made powerless the Devil, and given life to thy world: Do Thou, the same Lord give rest to the soul of Thy departed servant, of blessed memory and everlasting repose, the Priest (N.) in a place of brightness, a place of verdure, a place of repose, whence all sickness, sorrow, and sighing have fled away. Pardon every sin which he hath committed, whether by word, or deed, or thought; for Thou art good, and lovest mankind: for there is no man who liveth and sinneth not, and Thou only art without sin, and Thy righteousness is to all eternity, and Thy law is truth. For thou art the Resurrection, and the Life, and the Repose of thy departed servant, of blessed memory and everlasting repose, the Priest (N.) O Christ our God, and unto thee we ascribe glory, together with thy Father who is from everlasting, and thine all-holy, and good, and life-giving Spirit: now and ever, and unto ages of ages. Wisdom! O Blessed Theotokos, who art most holy save us. More honorable than the Cherubim and beyond compare more glorious than the Seraphim, thou who without stain barest God the Word, and art truly Theotokos we magnify thee. Glory to Thee, O Christ our God and our hope glory to Thee. Glory to the Father, and to the Son, and to the Holy Spirit: now and ever, and unto ages of ages. Amen. Lord, have mercy. Lord, have mercy. Lord, have mercy. Master Bless. May He who has dominion over the living and the dead: through the intercessions of his all-immaculate and allblameless holy Mother; of our venerable and God-bearing Fathers; and of all the Saints, establish the soul of his servant, of blessed memory and everlasting repose, the Priest (N.) departed this life, in his holy mansions, and number him among the Just: and have mercy upon us; forasmuch as He is good and loveth mankind. Eternal be your memory, O our brother, who are worthy to be deemed blessed and ever-memorable. Grant rest eternal in blessed repose, O Lord, to Thy servant the Priest (N.) who has fallen asleep, and make his memory to be eternal. Memory eternal! May his soul dwell with the blessed. Come, let us give the last kiss unto the dead, rendering thanks unto God, for he has vanished from among his kin and presses onward to the grave, and he troubles himself no longer with vanities or with the flesh, which suffers sore distress. Where now are his kinfolk and his friends? Lo, we are parted! Let us beseech the Lord that He will give him rest. Unto what shall our life be compared? Truly to a flower or a vapor or the dew of morning. Come, therefore, let us gaze intently at the grave. Where is the beauty of the body, where is its youth? Where are the eyes and the fleshly form? Like the grass they all have perished: they all have been destroyed. Come, therefore, let us bow down in humble submissiveness with tears before the feet of Christ. As we gaze on the dead who lies before us, let us all accept this example of our own last hour. For he vanishes from the earth like the smoke. Like a flower he has faded. Like the grass he has been cut down. Swathed in a coarse garment, he concealed in the earth. 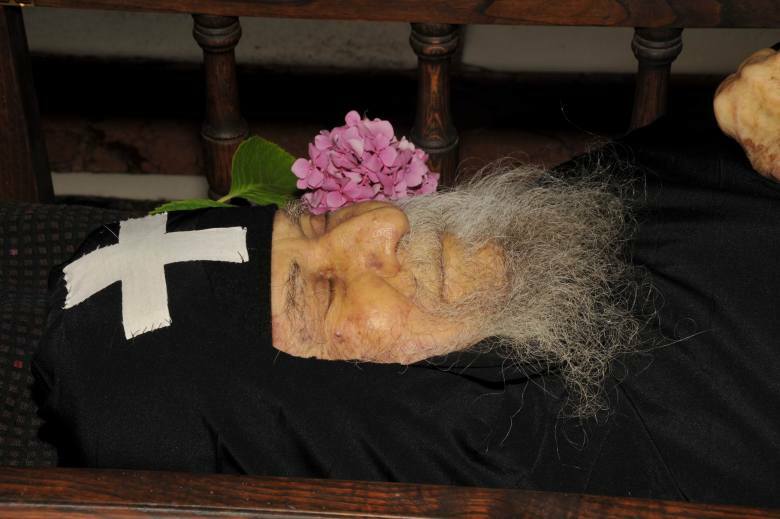 As we leave him hidden from sight, let us beseech Christ our God that He will give him eternal rest.